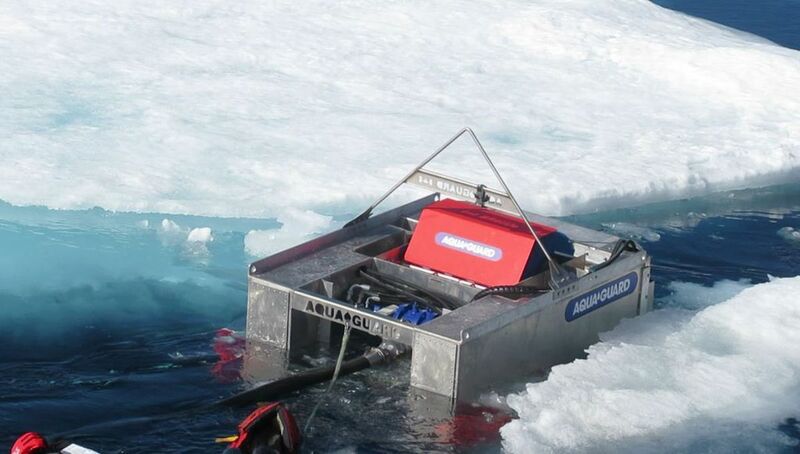 In late July, the Aqua-Guard Triton RotoX dipped into the icy Beaufort Sea. The goal was to test whether the prototype could clean up an oil spill in the Arctic. 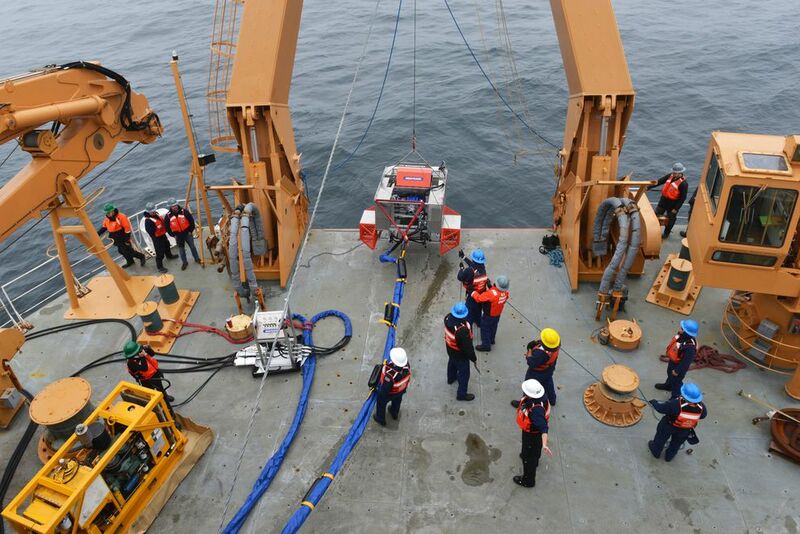 The oil skimmer, which was remotely controlled from the deck of the icebreaker Coast Guard Cutter Healy, is one of many technologies being examined by the U.S. Coast Guard's research and development program. The Canadian-designed RotoX was made to skim oil off Arctic water littered by broken sea ice — the very problem that environmental groups say should preclude oil development in offshore Alaska. The test comes as Arctic waters become clear of ice because of climate change. As the region warms faster than any other in the world, different industries — from oil production to defense to tourism — are eyeing the newly accessible seaways. But more ships in Arctic waters come with more risk, including the risk of oil spills or natural gas leaks. Fran Ulmer, chair of the U.S. Arctic Research Commission, said two potential oil spill scenarios are a cause for concern: a catastrophic oil spill from a tanker like the Exxon Valdez, or more likely, a spill from a small ship through an unintentional release or accident. Chief Petty Officer Angela Vallier, who was part of the team that tested the RotoX in July, said technology can clean up oil in open water and in pack ice. But water with broken ice still remains a problem. The RotoX was designed by Aqua-Guard, a producer of oil spill response devices, to work in that situation. At the time of testing, according to Vallier, the skimmer was the only one of its kind. The self-propelling skimmer is outfitted with multiple orange "teeth" slightly protruding from the front of the device. After maneuvering the RotoX to pockets of ice and oil, the skimmer chops up the ice into smaller pieces, which could be pumped through the skimmer or slide underneath. "Traditionally with a skimmer that wouldn't have something like that, you could potentially lessen your efficiency if ice gets in front of the skimmer and kind of dams up the skimmer," Vallier said in a phone interview. Being able to remotely guide the skimmer from a larger ship also gives it an advantage in ice-filled water. 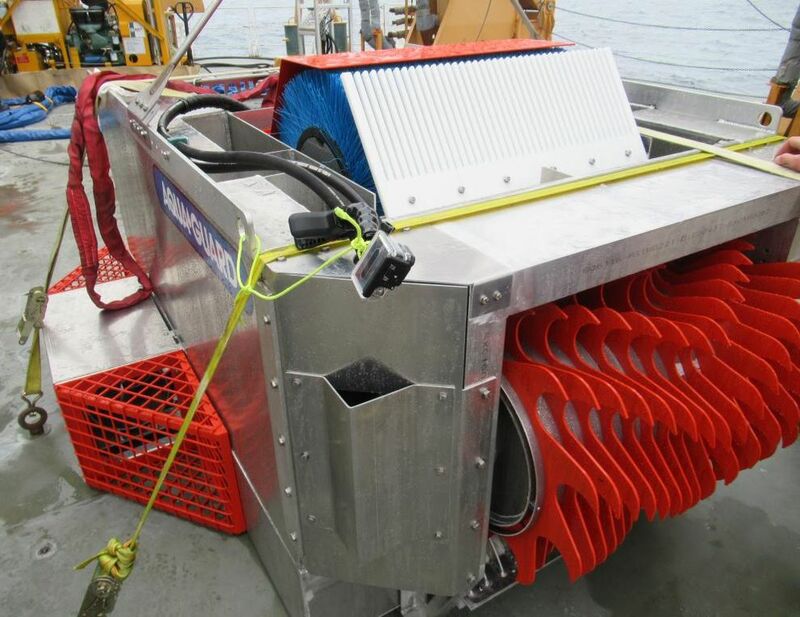 Compared to skimmers that are traditionally dragged along by large ships, RotoX is more nimble and could maneuver around the ice to reach oil spots. After first deploying the skimmer in non-ice-filled water, the team tested it in waters filled with ice of varying thickness. The results weren't dramatically successful. Although the RotoX did well propelling itself through ice floes, the teeth were so powerful that they actually became a detriment in reaching potential oil. According to Vallier, in thicker ice, the teeth gripped the ice and pushed the front of the skimmer up, severing contact between its brush and the water. In thinner ice, about an inch thick, the thrusters in the RotoX pushed the ice away so the teeth never touched it. "It wasn't entirely ineffective, it just didn't necessarily work the way the design was intended," Vallier said. The team is sharing its information from the test with Aqua-Guard, including what worked, what didn't go as expected and areas of improvement they identified. While the Healy chugged along in Arctic waters, days earlier Coast Guard Adm. Paul Zunkunft said that the United States was not prepared to clean up an oil spill in the Arctic. "I can assure you that if there is an oil spill, we're not going to recover all that oil," Zunkunft said in a speech at a symposium hosted by the U.S. Arctic Research Commission in July. He went on to discuss the recovery operations for the Deepwater Horizon oil spill in the warm waters of the Gulf of Mexico, which included burning, skimming and dispersing oil in flat, calm waters with a fleet of more than 6,000 ships. Yet even under those conditions, a 2010 analysis of the spill calculated that only 3 percent of the oil was recovered in the short term by skimmers. Zunkunft also pointed out there was infrastructure in place to support those dramatic recovery efforts in the Gulf of Mexico. "Now, you put that many people up in Barrow, Alaska, they better be carrying bear spray, because they're going to be camped out with mosquitoes because we don't have the infrastructure up there," Zunkunft said. Zunkunft's call for more infrastructure has been a theme in past reports detailing U.S. capabilities to respond to an Arctic oil spill. In 2014, the National Research Council released a study sponsored by several institutions, including the U.S. Arctic Research Commission, Coast Guard, Bureau of Ocean Energy Management and the National Academy of Sciences. The study acknowledged the natural obstacles that response crews might encounter during an Arctic oil spill, and laid out recommendations to improve the U.S. capability to respond to an oil spill, including bolstering baseline and environmental data and oil spill technology. It also said the number of personnel, equipment and safety resources able to respond to a large Arctic oil spill was not adequate, calling the absence of infrastructure a "significant liability." Three years later, Martha Grabowski, chair of the committee that produced the report and a professor at Le Moyne College in Syracuse, New York, said more investment in infrastructure and logistics is needed, as well as more baseline information and relationships between federal, state and local players. Looking at new technology, and how sensor systems can be integrated into the devices, is also an area for improvement. For Ulmer, the test was an important piece of the puzzle to gear up for more traffic sailing through Arctic waters. But there are still some limitations in preparing for a large oil spill. "The smaller kind of spill is increasingly important, and we need to do what the Healy is doing — testing new equipment for small spills," Ulmer said. "But for catastrophic spills, there's nothing that is going to get all the oil."